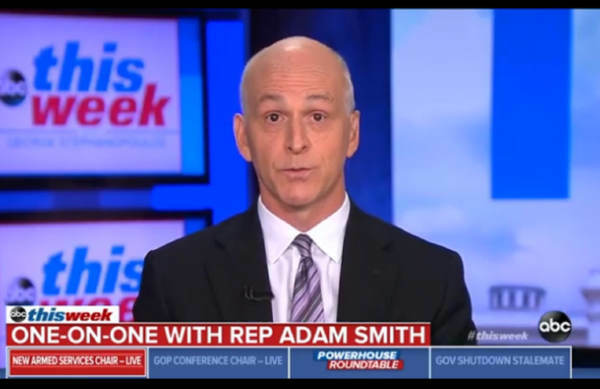 Democrat Congressman Adam Smith, the chairman of the House Armed Service Committee, has explained that President Donald Trump does in fact have the authority to use the US military to build a border wall. Appearing on on ABC’s “This Week,” Smith explained to host George Stephanopoulos that the president can declare an emergency and have a wall built to protect the nation’s borders. “Does President Trump have the ability, have the authority to declare a national emergency and have the military build his wall?” Stephanopoulos asked. “Well, unfortunately, the short answer is yes. There is a provision in the law that says the president can declare an emergency. It’s been done a number of times, but primarily it’s been done to build facilities in Afghanistan and Iraq and in this case I think the president would be wide-open to a court challenge saying, ‘Where’s the emergency?’” Smith responded. On Sunday, President Trump said that he is considering declaring a national emergency to secure money for the border wall. “I may declare a national emergency dependent on what’s going to happen over the next few days,” Trump told reporters. The statement lead to many Democrats declaring that they do not think President Trump would be able to do so, including California Democrat Rep. Adam Schiff. Previous Previous post: WATCH: Ocasio-Cortez Gets Asked How She’ll Pay For Her Programs. It Was A Disaster.